Ooooooh my gorgeous blue Butterfly! Hope all the Mothers out there have had a lovely day. After a phone call to mine I realised this is the first Mothers Day where I have not actually seen her. Hopefully I will make up for it next weekend as I plan to go back home for a couple of days. Today I got my creative head on, having not had much time to make jewellery I thought I should get stuck in! 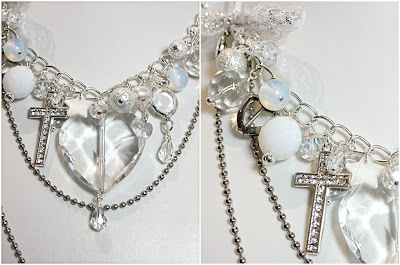 Here is my crystal goddess vintage themed necklace, complete with large glass heart crystal, surrounded by plenty more bling in the form of swarovski crystal, fresh water pearls, crystal charms and strung on beautiful ball chain. 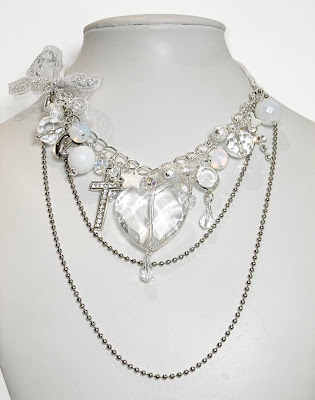 I have finished this with white satin ribbon to tie comfortably around the neck and a lacy bow to add a feminine touch. This is a truly classy vintage look that I absolutely adore making. Wow, that is amazing - really beautiful! Thank you Laura, really enjoyed making this!